As I get older and spend significantly more time working, running errands and “adulting,” the more I realize hat that ease is the number one thing I consider when it comes to style. Dresses that can be thrown on and worn to multiple occasions are the ones that I gravitate toward the most. That said, when I saw this dress at J.Crew the other day I knew I needed to add it to my wardrobe. Love this dress on you! Adulting isn't always fun but when you can make it easier with a cute dress it helps! I live in dress' like this on the weekend because it's effortless. I love the scarf on the bag! So cute and trendy! So cute! Love both ways you styled the dress! Love the hat and monogrammed bag! Such a cute dress! It looks great with the jacket. I am having major hair envy over here… and I think you are right, I need that dress! Love the simplicity of this dress! Holy girl, you are flawless! Love your outfit and your accessories! That dress is so cute, and I love it both ways! Two perfect summer looks! Love how you styled this dress! 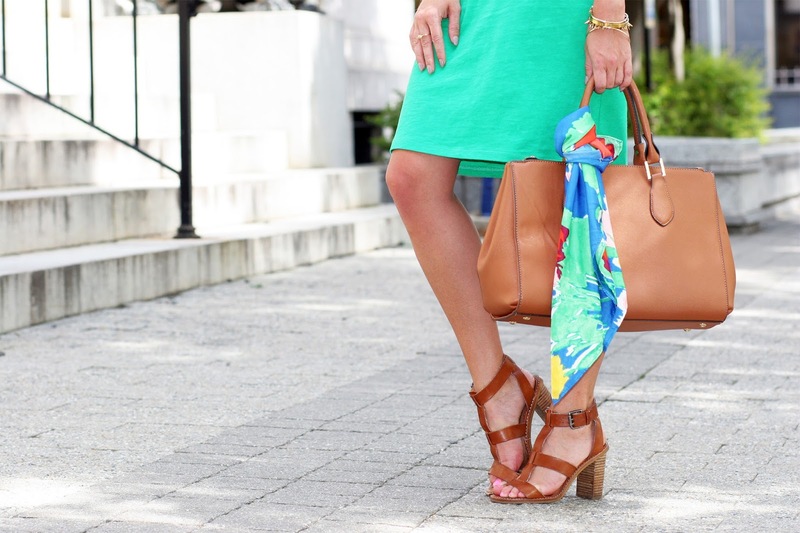 Love everything about this summery look! The dress is super cute, Sara! Love the jean jacket with it! So lovely! Very classic and stylish outfit and what a lovely Handbag. Your hair is gorgeous here! And that scarf makes the perfect accessory! I love how the colors in your scarf match the dress perfectly! I love posts that showcase the versatility of a piece. Love having versitle pieces! Loved how you styled the dress and the color is gorgeous! I love both of these looks! That hat is so cute! OMG this green color looking great on you.